The Legend pressure-side cleaner features a highly efficient booster pump (sold separately) for optimum power and unimpeded surface skimming, plus a large intake throat to handle large and small debris. Learn more about the Legend cleaner and if this model is the best fit for your pool with our Selection Tool. 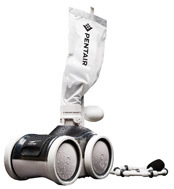 1: The Legend automatic pool cleaner comes ready to connect to a Booster Pump (P/N LA01N and P/N LA-MS05) sold separately.